Home Smartphones Software Cherry Mobile Alpha Luxe and Alpha Style Windows 8.1 Software Update Now Available! 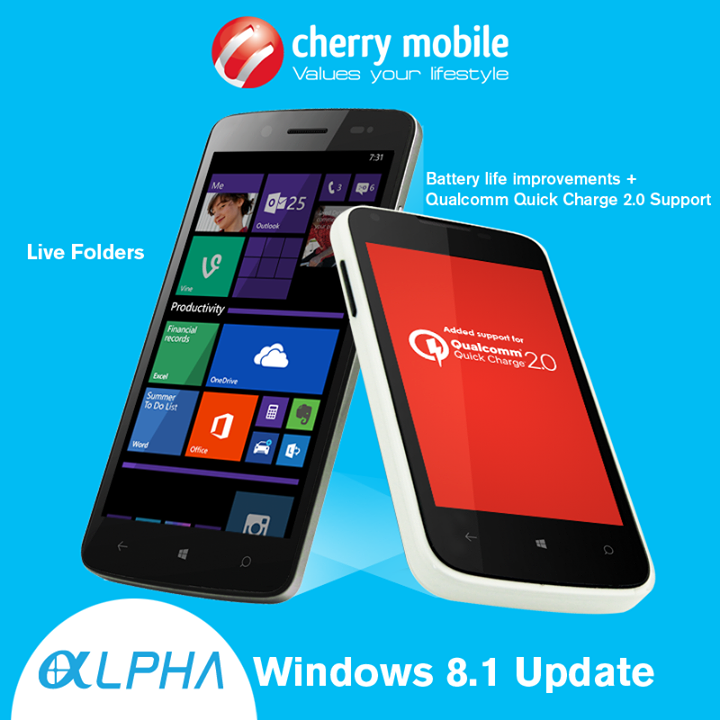 Cherry Mobile Alpha Luxe and Alpha Style Windows 8.1 Software Update Now Available! Good news to all lucky owners of Alpha Luxe and Alpha Style, Cherry Mobile has just announced the much awaited Windows 8.1 software update on the said devices. Curious about the Windows 8.1 update? Check out the improvements here after the jump. Live Folders - You can now organize your apps into folders on your Start screen! To create a Live Folder, just drag a tile over another tile and then name the folder. Automatic Scheduled Updates - When an update is available, it is automatically installed at the time of your choosing, such as overnight when your phone is charging. SMS Merge and Forwarding - The ability to select multiple SMS messages for deletion and forwarding. Improved IE on Mobile Website - Greatly enhances mobile usage and compatibility for Windows Phone users. Quick Charging - Qualcomm Quick Charge 2.0 support is included, letting Windows Phone users with the appropriate chipset take advantage Qualcomm's rapid, high voltage USB charging. Consequently, charging times should be upwards of 75% faster. Advanced Bluetooth - Advanced support for Bluetooth standards PAN (personal area network) 1.0 profile, aptX codec support for A2DP, and browsing support for AVRCP. These new standards give customers better streaming and compatibility for Windows Phone media. Improved Battery Life - Numerous fixes all work together to provide improved battery life for all Windows Phones. Note: Secure WiFi Connection (data connection not recommended), back-up data before updating and atleast 80% battery is needed.